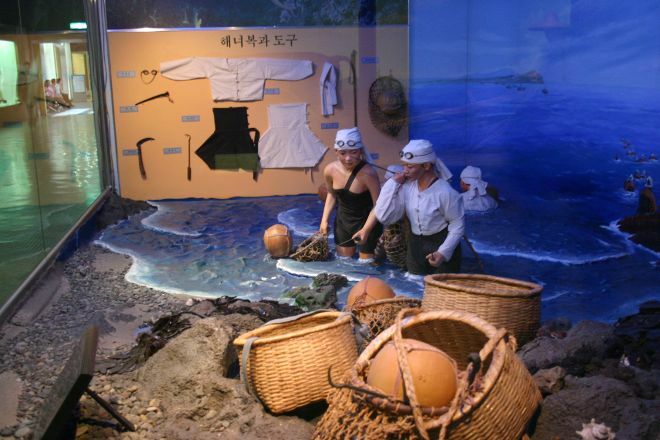 Haenyeo Museum gives a fascinating introduction to the culture of the region's hard-working female free-divers, otherwise known as Haenyeo. Literally translating as "sea women," the Haenyeo symbolize the Jeju province's semi-matriarchal family structure, and in the 1960s would account for 60% of Jeju's fisheries revenue, while 40% of Haenyeo husbands remained unemployed. Explore a recreation of a Haenyeo’s home, and her meals, and inspect displays of preserved diving equipment, including a pair of Haenyeo divers’ goggles and traditional swimsuit. Arrange your visit to Haenyeo Museum and discover more family-friendly attractions in Jeju using our Jeju online holiday planner . It is a "house of the Maids" passing by, and it is easy to know who sells seafood caught. However, I felt a different feeling here after I went to the National Museum of Jeju to see the difficult life of the old Jeju. Life as a woman more difficult in the lives of the people of Jeju-do that was difficult, especially the women who were really poor... I thought I'd have to. The numbers are now very much reduced, and I wanted to be very unusual in life as I was guided by the fact that these people were registered as UNESCO Intangible Cultural Properties. We were able to understand the young woman through various exhibits, and the Sehwa sea from the rooftop observation deck was beautiful. It is a good idea to visit the hotel. At the end of the souvenir shop, there are lots of pretty things to be heard. From Seogwipo to... It is a very winter breeze at the Seji Koji and Seongsan Ilchulbong. It is about 15km higher with a tingling face, and the Haenyeo Museum is located in one of the five places. Understood the life of the women. Jeju sea from the observation deck on the third floor. Ah ~ Jeju... It's okay.